Set in the Jungle this slot game from Playtech not only has a bonus game, but also a free spins round. If you like the next generation of video slots that come with great game play features then this is the sot for you. The graphics are bold, bright and simple, yet they are also highly entertaining and give a real sense of fun to this comical slots game. 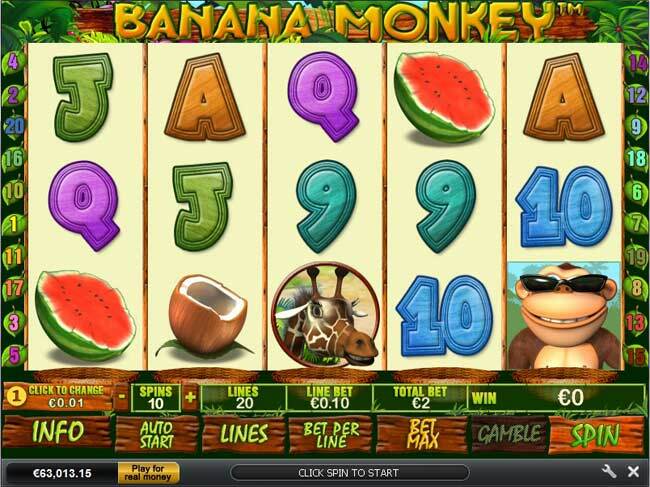 Collect four Bananas as you play, by spinning in the Bonus symbol and you can win 8 free spins. These free spins come with an impressive 3x multiplier and if a Banana symbol appears during the free spins round then you will automatically win another 4 free spins. Spin in a Bonus symbol on reels one, three and five all at the same time and you will win the Bonus Game, here you have to guide the monkey to jump from tree to tree to help amass a load of cash.